This design is free from the Berroco website. 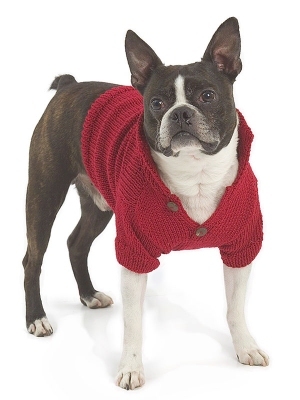 : This adorable sweater is sure to keep your furry friends warm through winter! This design is free from the Berroco website. Remember to download or print the pattern by following the link provided on this page, as it will not be shipped with the yarn. Size US 6 straight needles, US 7 straight needles, two buttons, and stitch holders are required but not included. Gauge: 20 sts and 28 rows over 4"
$17.00 -- Kit price including yarn only (no book or pattern).